The Indie Royale Valentine's Bundle is here, but much like love itself, it's a brief and fleeting thing that will soon be just a memory. Want something special for your honey on Valentine's Day? 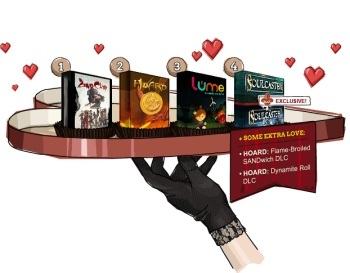 Feast your eyes on the Indie Royale Valentine's Day Bundle, a collection of sweet gaming goodness that won't go straight to your thighs. Zeno Clash, Hoard [plus keys for the Flame-Broiled SANDwich and Dynamite Roll DLC packs], Lume, Soulcaster and Soulcaster 2 are on tap this time around and if you beat the minimum price you'll also get a copy of Music to Play Games By Too from One Life Left, a compilation of 13 music tracks that are, so the story goes, ideal to play games by. The minimum price is currently parked at a little over $4, which I'd say is a pretty fair deal for five games, some DLC and some tunes. As always with the Indie Royale, paying $10 or more will also force the minimum price down, so those of you who have lots of money can lend a hand to those of you who don't. The Indie Royale Valentine's Bundle ends in less than two days [I told you it wouldn't last] so stop disappointing her where it counts - make indie game fast at indieroyale.com!